We had another pretty nice weekend, though this one was quite a bit calmer than usual. Which was a good thing - downtime was much needed, and much appreciated! On Friday, we went out for sushi (so much for not eating out at all last week - at least we made it to Friday!) and then saw Inception. Inception was really, really good! Weird, and smart, and fun, and just plain interesting. I enjoyed it thoroughly, even though Nathan knocked my beer out of my drink holder and onto my lap at a particularly exciting moment. C'est la vie. Saturday found us waking up early to squeeze in a five mile trail run before we left town for our adventures in Tyler. I had not run the trail in about six months and could definitely feel the difference in terrain. I am looking forward to running the trail more when the weather cools down and this century ride is behind me! After cleaning and packing, we headed to Tyler, which is about a 90 minute drive from Nacogdoches. 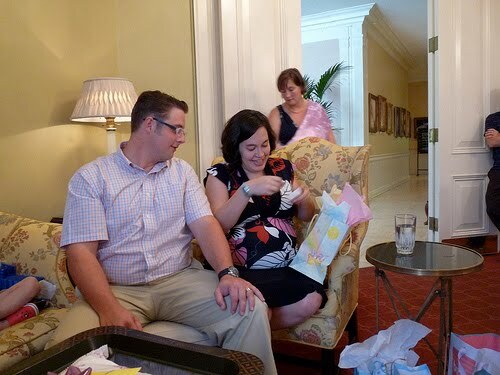 Mary T and her husband Matt were having a fancy baby shower at a country club, and while there we got to take advantage of the open bar, hold a variety of adorable babies, and swim in a large pool while employees brought us drinks. It was definitely a lovely and relaxing day. 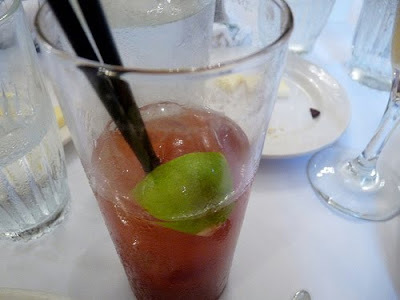 Bloody Mary's are my new favorite drink. 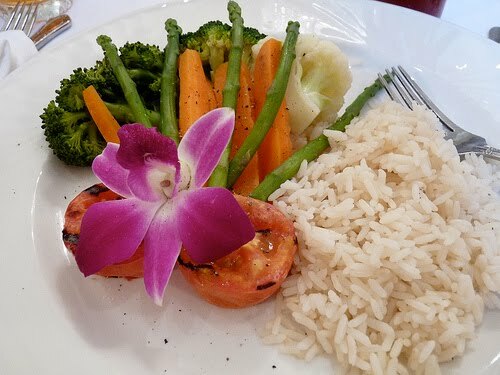 This is the vegan lunch the club came up with. Not bad, but basically rice and veggies. Good think I was able to fill up on Bloody Mary's! Instead of driving home after the shower, we had decided to spend the night in Tyler State Park, as Nathan had not slept in his hammock in a few months and was having withdrawals. We ended up getting there just as the sun was setting, leaving us just enough time to pitch our hammocks and read by flashlight. We woke up around 7AM and decided it would be nice to relax at home than at the park, so we packed things up and headed out. 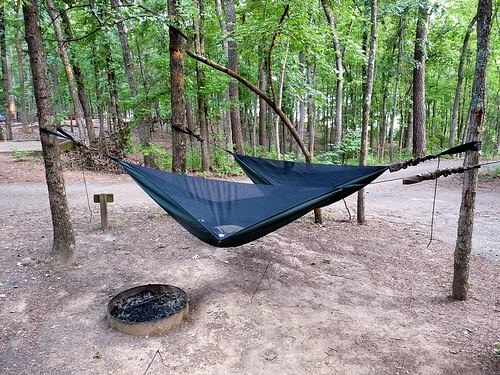 Shortest camping trip ever, but it is always nice to sleep under the stars. Our Sunday also included cleaning out the refrigerator, which makes me as if all is right in the world, and the usual kickball game, which I'm tired of photographing. 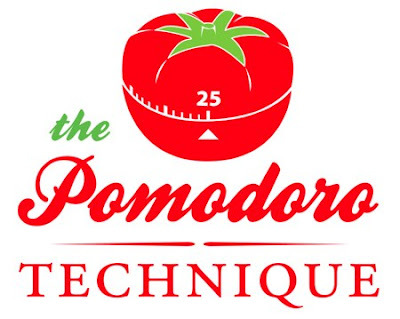 It also included a new discovery - the Pomodoro Technique. Basically, you set a timer with a ticking sound for 25 minutes (I did 30) and then stay focused and on task until the buzzer goes off. So simple it seems silly, but I tried it while I was writing yesterday and there was something about that ticking sound that made me feel a sense of urgency. When the timer went off, I was still writing, and I kept writing for about another fifteen minutes. I like the Pomodoro Technique, even if I'm just using a kitchen timer. And that about wraps up my weekend adventures. 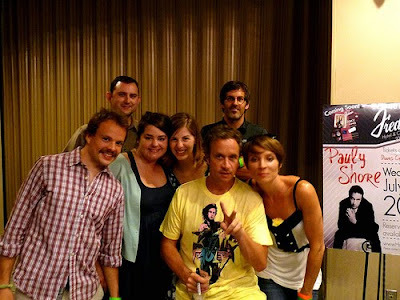 Before I rush off to work (late... oops...) I leave you with this photo of a bunch of drunk people and Pauly Shore. Enjoy!